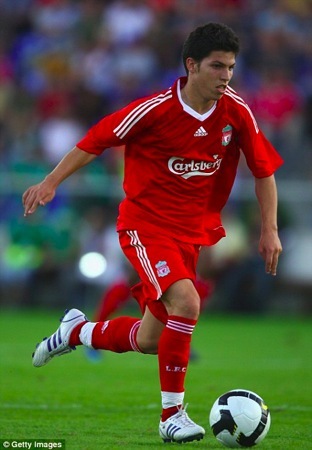 Daniel Pacheco signed from Barcelona in 2007 and has just been promoted to the Liverpool first team with shirt number 12. This shows how people at Liverpool think highly of him. During the UEFA U19 Championship held in France in July, Daniel played brilliantly and won the Golden boot after scoring four goals and helping Spain get to the final. He was chosen as World Player of the Week by Goal.com because of this. I feel 2010-2011 will be the year of Daniel Pacheco. This kid has real talent. Of course, he lacks experience but he’s lucky enough to have Fernando Torres as mentor… Maybe not getting a striker during this transfer window is a blessing in disguise: this will force the Manager to play Daniel Pacheco more often and, consequently, give him the needed playing time to further his development. Who needs big-name players when you have a 19 year old gem in your side? It could well be a blessing in disguise. The last time Liverpool was facing a similar crisis, Liverpool had to play young players like Redknapp, Fowler, Matteo, etc. And it was also because of the crisis that they had to play a very young player by the name of Michael Owen. I remember that the shirt he was wearing seemed way too big for him. That said, I believe Liverpool has a lot to gain by following Manchester United’s model. I may not like Manchester United, but that does not mean that I should not have any respect for that team. When Liverpool was winning almost everything, United was in deep trouble. But, in the background they were patiently working on producing homegrown talents. When these talents were ready, United unleashed hell. They unleashed a bunch of young players with a lot of stamina, and who would not require a lot of time to heal from injuries. Players like Scholes, Beckham, Phil and Garry Neville, Giggs, etc. What has Liverpool produced after Folwer, Carragher, Matteo, Gerrard, and Owen? Not much. The accademy should be reviewed and improved. So do the recruiters. There are many many talents around the world which won’t cost an arm and a leg to get. French teams used to do that before other big European teams would steal these talents from them. Leonardo and Ronaldinho started at PSG before moving to bigger clubs. I just hope Liverpool does better this year and I hope they don’t continue to play players in positions which are not theirs. Babel and Kuyt used to play as strikers before being used a wingers in Liverpool. Benitez also played Cissé on the wing whereas you could only get the best of Cissé by playing him as a striker. I can only hope that the new manager will do things differently. New blood, new way of thinking for Benitez was doing weird things in his last years. He wanted a winger who could cross. He had Pennant, but let him go. He had a good striker in Peter Crouch, he let him go. He had a good striker in Robbie Keane, he let him go without giving him a fair chance. He was always substituted. He wanted to sell Alonso because Alonso did not want to travel because his wife was going to give birth to their first child. How can you expect someone who is about to become a father for the first time to travel with the team? You are a father too, surely you can understand Alonso’s feeling. And what happened? Alonso gave his best ever performance in a Liverpool shirt and then went away. Benitez could have force the contract obligation on Alonso, but his ego was too strong. Anyway, we can only hope that now that everything is settled, and no more transfers affecting the mind of the players that we will have a good season. It was very promising against Arsenal, then very bad against Manchester City, and a very hard fought win against West Bromwich Albion. WBA are among teams that mightly Liverpool should breeze through. After all, we are not talking about Portmouth, but Liverpool Football Club. We don’t need a lot of stars. We just need players we have to do what they have to do very well. I prefer to have to have a set of average players, but who play well together and know each other very well. They will then be a well-oiled machine. It’s not different from a motorcycle. A motorcyle with parts on the same level will perform very well. On the other hand, a motorcycle with a very very good cylinder won’t perform very well if the carburator is not on par. The Liverpool who won the Champions League in 2005 did not have megastars, yet they managed to beat Chelsea and its superstars and AC Milan with players like Kaka, Crespo, Shevchenko, Seedorf and Maldini. I don’t know how the season will turn out, but I have a feeling that this is some kind of optimism in the air at Anfield, except for the sale of the club. New manager, new chance for everyone to impress. I really like the young players, like Pacheco and Ngog. I would even like to see Paul Ince’s son play. All in all, I think it’s time to rebuild the club, not just the squad. But, it’s hard to do this with the two American owners. That’s what I was mentioning in my previous post. I don’t want Liverpool to sell its soul just to be the next Manchester City or Chelsea. Club with history like Liverpool and Manchester United have a greater destiny than just being the successful team of the moment. I don’t believe this guy plays as a pure centre-forward, he’s just a little behind in that space between the midfield and the strikers; nonetheless he’s an attacking minded player. I watched him at the recent Euro U-19 it was i think, and this boy does have great talent. An eye for through passes, a very creative vision and quite a fantastic shot. I actually do feel that Liverpool have got some nice little kids coming out of the academy; Martin Kelly, David Amoo, Chris Mavinga, and the now famous Pacheco. P.S. Posted this comment on fbook too, sorry for the double post. Same song and players leave eventually without leaving any mark on the club. Yeah. Sometimes players show promise but do not deliver at the highest level. That’s life I guess. But a lot of people are saying that Pacheco has a glorious future. Let’s all wait and see. It’s not entirely their fault. Benitez was quite reluctant to give these guys a chance just like with Robbie Keane. The latter said that he was not the type of stricker who likes to play as lone striker, but rather with a partner in attact. That’s where he gives the best of himself. Yet, Benitez persisted in playing him alone when Torres was injured. Le Tallec and Sinama-Pongolle had great potential, but once again Benitez did not really like them. When called upon from the bench, Sinama-Pongolle used to score. Le Tallec has found the net a few times too, but was then loaned each season. You will not see these guys have an impact on the club if they are loaned out every time. Pongolle did well after he left. On the other hand, Benitez kept faith in players like Lucas and El-Zhar. People tend to say that he was not given enough money to buy players. The truth is, he was given money, but did not spend wisely. Dossena? Josemi? Nunez? His good signings were: Reina, Alonso, Garcia, Agger (? ), Skrtel, Torres, and Kyrgiakos. I must say that I was disappointed with the first game of the latter, but then became a big fan. Our defence is not bad, but our offence needs to be reviewed. We lost against Manchester United…again. Based on the first half alone, we deserve to lose, but the performance in the second half was much better. I, personally, don’t know what Hodgson tell his players at half time, but it seems that Liverpool have been starting very badly and then things change in the second half. Honestly, I was expecting a lost today. I just did not see Liverpool having the same quality as United at the moment. But, I was happy to see some positive things like in the second half. Did they start playing football when they had nothing to lose? Who knows? I also does not expect much this year because Liverpool is in a transition period. What I am more worried though is the situation about the sale of the club. We are on the point of becoming another Leeds United case. Why, why on earth, did Rick Parry bring in these two Americans? Manchester United is a better team right now. And the major issue for Liverpool is the sale process. But, still, the team needs to fight to be in the first 4 again in order to compete in the Champions League. Surely..a nice signing…Hope liverpool makes no mistakes cause they are making costly mistakes right now…they are facing a relegated position this wnt last forever definitely..But they clearly are worth it right now don’t u think so? …But they clearly are worth it right now don’t u think so? It pains me to say it, but yes they do deserve it for now. The players are not performing and they seem to wait until they are 2-0 down to start playing well.